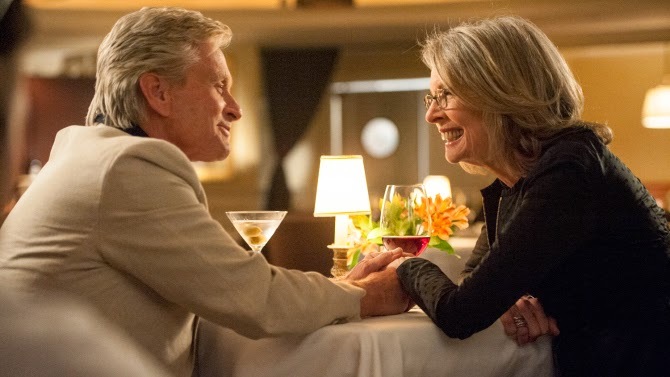 And So It Goes is the newest film by Rob Reiner, starring Michael Douglas and Diane Keaton, and takes place in beautiful Connecticut. Douglas and Keaton definitely have chemistry together, but I found the story to be a bit slow-moving. Oren Little (Douglas) is a realtor who is trying to sell a $5.8M mansion for $8M. We later find out that it's his own house, and that he's taking off to Vermont as soon as he sells it. Meanwhile, he lives in "Little" Shangri-la, a small apartment complex, which he also owns, though he's never gotten along with his neighbor, Leah (Keaton), who lives in the apartment next door to him. When his former-junkie son randomly contacts him and says he's going to jail for nine months, he drops off his daughter (Sterling Jerins) with Oren, and Oren must suddenly learn how to be a grandparent, with Leah's help. My main problem with this movie is that it can't decide if it wants to be a rom-com (Oren and Leah's romance of sorts), a "family movie" (the problems between Oren and his son, and his relationship with his granddaughter), or a "dysfunctional comedy" about Oren and his apartment tenants. We get a little of all of that here, and even though the film is only about 90 minutes long, it seems to drag in spots. Keaton has a few lovely singing scenes - she's a lounge singer by night - and the acting is good, too, but the story could have been simplified a bit. Maybe see this movie. It's definitely going to appeal to the older generation, just based on the story and its cast, but I'm sure it will do well at the box office since Douglas and Keaton are headlining it. It wasn't as funny as I wanted it to be either, although there were definely patches of humor throughout, and the film's location, in CT by the water, is gorgeous. I'd recommend this movie for anyone who is looking for a decent story and can stand a slow pace; if that's not you, then you should skip this one. And So It Goes is in theaters today, July 25th, and is rated PG-13 with a runtime of 94 minutes. 3 stars out of 5. Yeah, it's definitely geared towards an older audience. A few people did tell me that re the billy Joel song! I guess that older audience is me. *sigh* When did THAT happen? Looked interesting in the previews. I'll wait for redbox I believe. Thanks for the review. I did want to see this based on the previews, I guess I will wait to see it at home:) Thank you!